This stunning false-color view of Saturn’s moon Hyperion reveals crisp details across the strange, tumbling moon’s surface. Differences in color could represent differences in the composition of surface materials. The view was obtained during Cassini’s very close flyby on Sept. 26, 2005. Static electricity is known to play an important role on Earth’s airless, dusty moon, but evidence of static charge building up on other objects in the solar system has been elusive until now. A new analysis of data from NASA’s Cassini mission has revealed that, during a 2005 flyby of Saturn’s moon Hyperion, the spacecraft was briefly bathed in a beam of electrons coming from the moon’s electrostatically charged surface. NASA’s Cassini spacecraft is monitoring the evolution of a mysterious feature in a large hydrocarbon sea on Saturn’s moon Titan. The feature covers an area of about 100 square miles (260 square kilometers) in Ligeia Mare, one of the largest seas on Titan. It has now been observed twice by Cassini’s radar experiment, but its appearance changed between the two apparitions…. 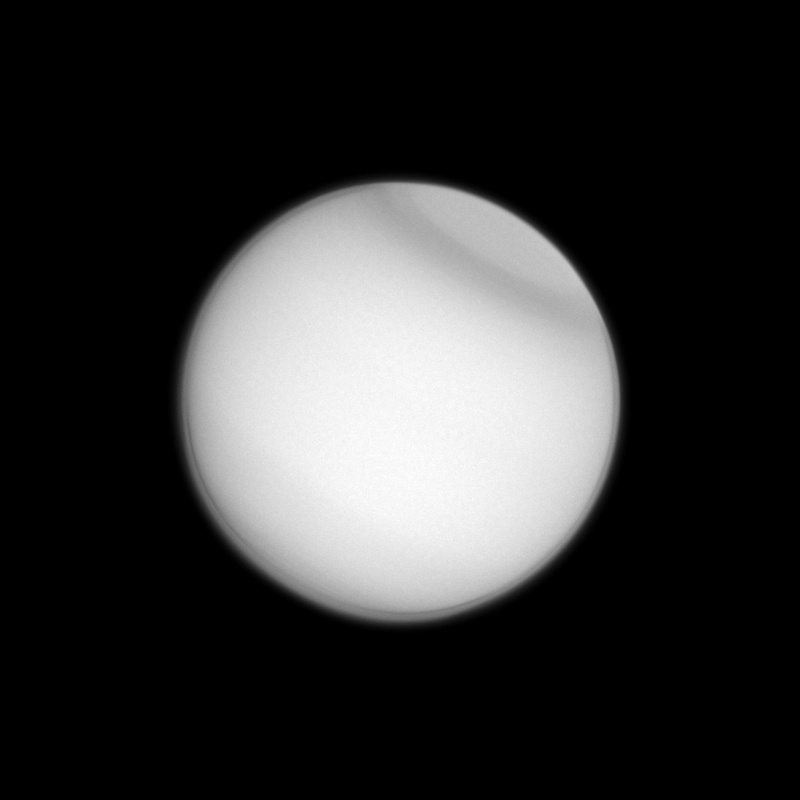 This is the first hexagon movie of its kind, using color filters, and the first to show a complete view of the top of Saturn down to about 70 degrees latitude. Spanning about 20,000 miles (30,000 kilometers) across, the hexagon is a wavy jet stream of 200-mile-per-hour winds (about 322 kilometers per hour) with a massive, rotating storm at the center. There is no weather feature exactly, consistently like this anywhere else in the solar system. Weather patterns on Earth are interrupted when they encounter friction from landforms or ice caps. Scientists suspect the stability of the hexagon has something to do with the lack of solid landforms on Saturn, which is essentially a giant ball of gas. Better views of the hexagon are available now because the sun began to illuminate its interior in late 2012. Cassini captured images of the hexagon over a 10-hour time span with high-resolution cameras, giving scientists a good look at the motion of cloud structures within. Titan’s polar collar — previously seen by Voyager 2 and the Hubble Space Telescope — has now been observed by the Cassini spacecraft, seen here in ultraviolet light. The collar is believed to be seasonal in nature. Researchers are still studying its cause and evolution. This view looks toward the Saturn-facing hemisphere of Titan. North on Titan is up and rotated 32 degrees to the right. The image was taken with the Cassini spacecraft narrow-angle camera on April 13, 2013 using a spectral filter sensitive to wavelengths of ultraviolet light centered at 338 nanometers. The view was acquired at a distance of approximately 1.1 million miles (1.8 million kilometers) from Titan and at a Sun-Titan-spacecraft, or phase, angle of 4 degrees. Image scale is 7 miles (11 kilometers) per pixel. 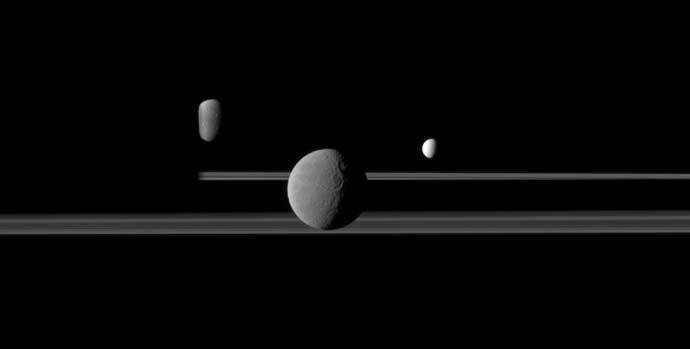 Cassini observes three of Saturn’s moons set against the darkened night side of the planet. From left, Dione, partly obscured by Saturn, then Rhea and Enceladus. This view looks toward the northern, sunlit side of the rings from just above the ringplane. A new analysis of data from NASA’s Cassini spacecraft suggests that Saturn’s moons and rings are gently worn vintage goods from around the time of our solar system’s birth. Though they are tinted on the surface from recent “pollution,” these bodies date back more than 4 billion years. They are from around the time that the planetary bodies in our neighborhood began to form out of the protoplanetary nebula, the cloud of material still orbiting the sun after its ignition as a star. The paper, led by Gianrico Filacchione, a Cassini participating scientist at Italy’s National Institute for Astrophysics, Rome, has just been published online by the Astrophysical Journal. These two global images of Iapetus show the extreme brightness dichotomy on the surface of this peculiar Saturnian moon. The left-hand panel shows the moon’s leading hemisphere and the right-hand panel shows the moon’s trailing side. Data from Cassini’s visual and infrared mapping spectrometer (VIMS) have revealed how water ice and also colors — which are the signs of non-water and organic materials — are distributed throughout the Saturnian system. The spectrometer’s data in the visible part of the light spectrum show that coloring on the rings and moons generally is only skin-deep. Using its infrared range, VIMS also detected abundant water ice – too much to have been deposited by comets or other recent means. 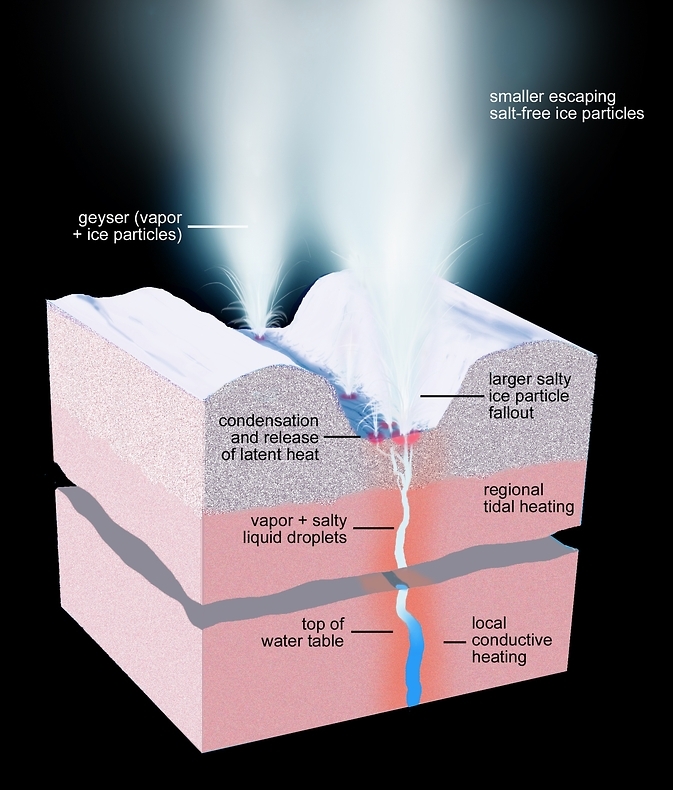 So the authors deduce that the water ices must have formed around the time of the birth of the solar system, because Saturn orbits the sun beyond the so-called “snow line.” Out beyond the snow line, in the outer solar system where Saturn resides, the environment is conducive to preserving water ice, like a deep freezer. Inside the solar system’s “snow line,” the environment is much closer to the sun’s warm glow, and ices and other volatiles dissipate more easily. The colored patina on the ring particles and moons roughly corresponds to their location in the Saturn system. For Saturn’s inner ring particles and moons, water-ice spray from the geyser moon Enceladus has a whitewashing effect. Farther out, the scientists found that the surfaces of Saturn’s moons generally were redder the farther they orbited from Saturn. 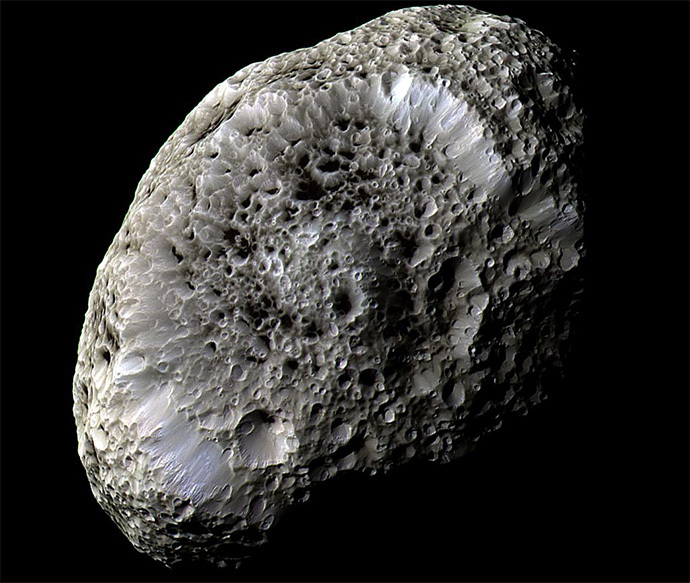 Phoebe, one of Saturn’s outer moons and an object thought to originate in the far-off Kuiper Belt, seems to be shedding reddish dust that eventually rouges the surface of nearby moons, such as Hyperion and Iapetus. A rain of meteoroids from outside the system appears to have turned some parts of the main ring system – notably the part of the main rings known as the B ring — a subtle reddish hue. Scientists think the reddish color could be oxidized iron — rust — or polycyclic aromatic hydrocarbons, which could be progenitors of more complex organic molecules. 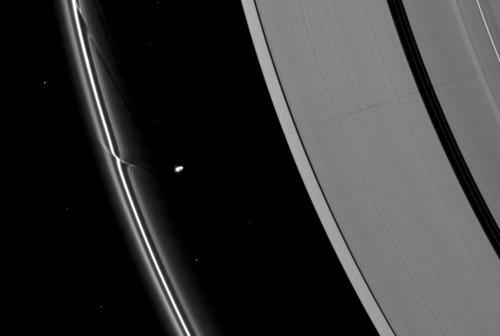 The effects of the small moon Prometheus loom large on two of Saturn’s rings in this Cassini image. 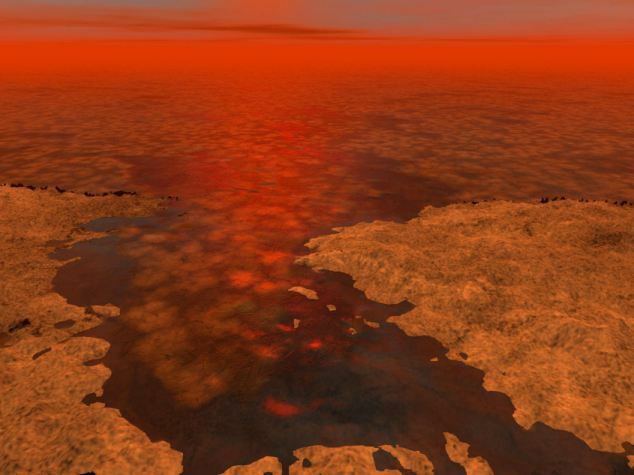 Saturn’s moon Titan is home to lakes of massive hydrocarbon ‘icebergs’ that could form exotic forms of life, scientists have claimed. Nasa researchers say the new theory may also explain bizarre reading from the vast lakes and seas on the moon. ‘One of the most intriguing questions about these lakes and seas is whether they might host an exotic form of life,’ said Jonathan Lunine of Cornell University, who co-authored the study. Titan is the only other body besides Earth in our solar system with stable bodies of liquid on its surface. However, while our planet’s cycle of precipitation and evaporation involves water, Titan’s cycle involves hydrocarbons like ethane and methane. Ethane and methane are organic molecules, which scientists think can be building blocks for the more complex chemistry from which life arose. Cassini has seen a vast network of these hydrocarbon seas cover Titan’s northern hemisphere, while a more sporadic set of lakes bejewels the southern hemisphere. Cassini scientists assumed that Titan lakes would not have floating ice, because solid methane is denser than liquid methane and would sink. But the new model, revealed today, considers the interaction between the lakes and the atmosphere, resulting in different mixtures of compositions, pockets of nitrogen gas, and changes in temperature. The result, scientists found, is that winter ice will float in Titan’s methane-and-ethane-rich lakes and seas if the temperature is below the freezing point of methane — minus 297 degrees Fahrenheit (90.4 Kelvins). ‘We now know it’s possible to get methane-and-ethane-rich ice freezing over on Titan in thin blocks that congeal together as it gets colder — similar to what we see with Arctic sea ice at the onset of winter,’ said Jason Hofgartner, first author on the paper and a Natural Sciences and Engineering Research Council of Canada scholar at Cornell.